Gene Furchgott's Retirement Party - YoArt! October was a busy month for Yo Art and we especially enjoyed showing our appreciation to our Founder, Gene Furchgott. After 11 years of shepherding and building the organization into what it is today, Gene stepped aside as Executive Director, and Mayor John Tecklenburg joined us in thanking Gene for his effort. Gene built an incredible amount out of very little. Armed with a mandate from then Mayor Joe Riley and an endowment from his Nobel Laureate uncle, Gene began an after-school art program with 35 students in one school. Patiently and steadily he built the program adding classes and instructors and expanded to other schools in need. Today, Yo Art is educating more than 1,000 students per year in subjects such as photography, graphic design, filmmaking and coding. We expose Lowcountry students to the tools and software integral to their futures. We are very grateful for all the time and energy Gene gave to this important organization! 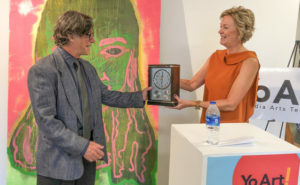 President of the Board, Lori Bate, presented Gene with a clock, a symbol of all that time have gave Yo Art, and since, maybe, he’ll have a bit more of it now! 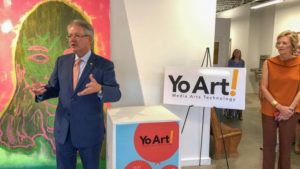 A big “thank you” to Mayor Tecklenburg for attending our event and for his support of Yo Art! We appreciate your effort!